Hi everyone! It's time once again for me to share my latest card created for Classy Cards N Such. I know you all have a collection of embossing folders and my collection keeps growing. Some of them are becoming more intricate and elegant like the one I used on today's card. If you are short on time, one of the easiest ways to design a quick card is by using an embossing folder. Some of them, like the Spring embossing folder I used here from Crafts Too, have designs that are more than just a repeated pattern. By adding black pearls to the centers of the embossed flowers and in the flower buds, I enhanced the actual design and gave it added dimension. By adding Black Soot Distress Ink to the edges of my vanilla card base I gave the illusion of another layer while pulling the black, azalea, and vanilla color scheme all together. All that's left to do is add a sentiment in a spot that doesn't take away from the intricate design, which for me was the lower right hand corner. Next time you need a card in a pinch, try using an embossing folder for a quick and elegant design! 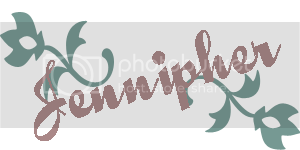 Sentimental Sundays 74: Step out of your comfort zone ➦Did you happen to notice there is no patterned paper on my card? That's way out of my comfy zone! 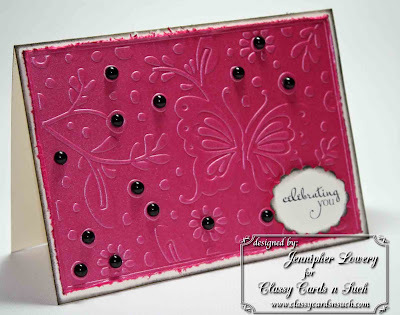 Paper Play Challenges: White + one ➦ I used a vanilla card base with a shimmery pink cardstock. Not sure if my black pearls count as part of the colors or not. Stampin' Royalty Challenge: KISS: Keep It Simple Sweetie ➦ This was definitely a simple card to make. 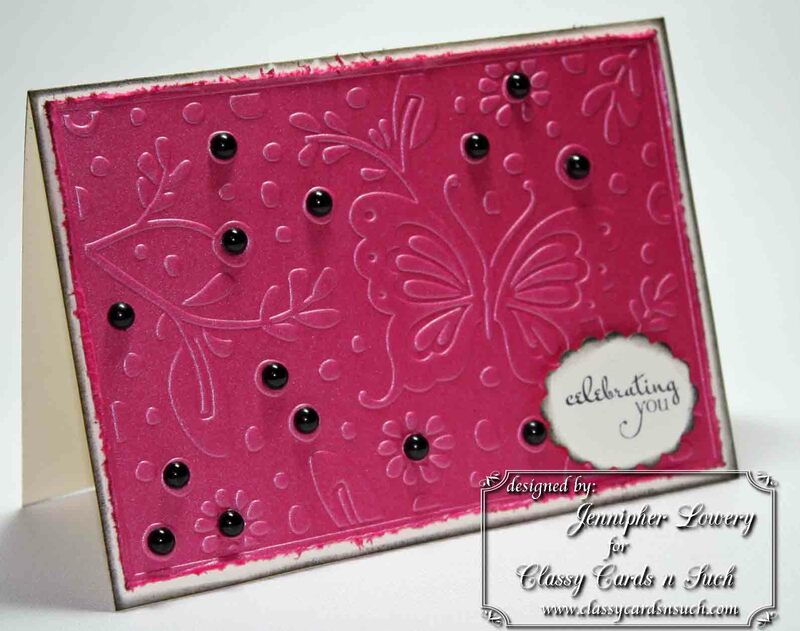 Stamps R Us Challenge : Birthdays ➦ My scalloped oval is stamped with "Celebrating You" from Verve. Thanks for dropping by and sharing your thoughts with me. I also wanted to say that I have been super busy as I try to put on the final touches of the Perfect Sentiments Challenge Blog which will launch this coming Wednesday. So, I know that I owe many of you some return comments and I will get to them I promise. I also hope you will come join us and play along as we do have a prize for our launch challenge! hun, as i am the ultimate folder-addicted, this card is making my day! love this pure and noble card! You have succeeded in doing a simple but very effective card. I love inking the edges and distressing the paper you used quite a lot and with the pearls put well you have set brilliant accents. Jennipher, this card is gorgeous! Love the colour, so rich and vibrant, and the embossing is lovely. Great details with the embossing and pearls! I'm looking forward to the launch of your new challenge blog. Love the simplicity and beauty of this! Just gorgeous. This is such a beautiful and so elegant card. Love how you simply used the embossing folder to make this pretty card. I will have to remember this. Beautiful. The black around the edge is the perfect finishing touch. I agree, Jennipher. Sometimes you want 'design', not just a repetitive pattern. I love this folder. Very pretty! Oh so happy to comment on behalf of Stamps R Us, so glad you entered into the challenge, love this card. Thanks for joining us at Stamps R Us. This is simply beautiful! Love the black accents. Thanks for playing this week! Jennipher, this is lovely and so many good tips as well! Oh I love this Jennipher! Perfect CAS card! I love this card, the embossing is very pretty and the pearls add a wonderful touch.